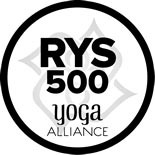 the ONLY 500hr Yoga Alliance Registered School in the Caribbean! that is completely accessible and VERY intensive! in the hopes that it produces the best instructor in YOU that you can be. We use a combination of nationally renowned Caribbean faculty and internationally world renowned faculty to not only keep the cost of the training affordable, but to help us offer a spicy, balanced program that would be recognized anywhere you taught. The next Sangha Trinidad’s Yoga Teacher Training will begin May 2, 2020!! we might change faculty, and tweak some things, but the course work is the same. In trying to keep the program accessible, we have two (2) sessions during the weekdays – one morning session and one evening session. If you are interested in either session, please let us know which session when you email us. Those of you who have kids and really can’t do evenings, but can swing the time off during the day, now have an option. The morning session however will be determined by the numbers registered. 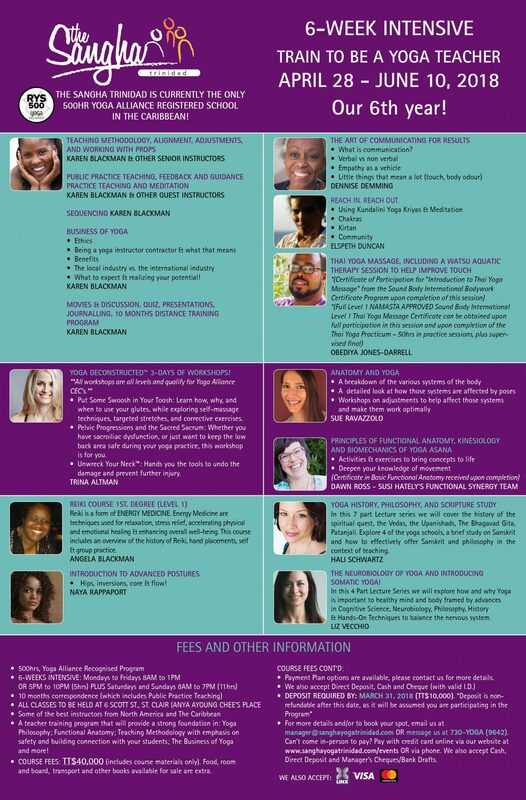 The course is 6 weeks and while it is a 500hr Yoga Alliance program, we cover over 750hrs. of work! The fee is TT$40,000.00 and includes your compact binder…your Teacher Training Bible and other certain course materials. **Access to the Mentoring program is not guaranteed. Kripalu School of Yoga in the U.S. So $4200USD OR $27,300 just for the tuition. Then add the cost of airfare, accommodation, food and living and the loss of income each time you have to travel to finish a module…that’s 4 trips!! The last we saw, the Moksha Yoga Training in the Canada was about $4500CDN, then add the cost of airfare, accommodation, food and living and the loss of income. You are also required to pay $1000 +tax* CND/US non-refundable deposit. The last group of instructors who went to this Training from Trinidad spent just over $60,000TTD for everything! There are about 65 to 70 people per Training. Not sure what the Bikram Yoga Training is like now, but back in the day it was about $16,000USD OR $104,000TTD to $20,000USD OR $130,000TTD…Then add the cost of airfare, accommodation, food and living and the loss of income. AND there are about 400 people per Training! Here nah…it ent easy out there! We found that only certain people could go to these Trainings and you mos def had to be in a particular income bracket. If you had a family, job commitments etc., the idea of this seemed even more out of reach. And if you are from the Caribbean and don’t have a VISA it’s even harder to access these international programs. Our hope with The Sangha Trinidad’s Yoga Teacher Training is to make teacher training way more accessible to those in the Caribbean. There are so many of you who would make awesome instructors…you have so much to offer. We wanted to give you the same quality and the same attention to detail without you having to leave or lose. You can work around your work schedule and be near for your family if need be. 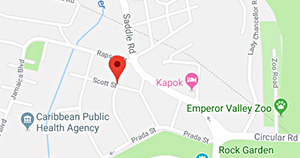 If you are from up the islands, you don’t have to travel far. We have one person who is doing the morning session for the first month…for her vacation and then doing the evening session for the last two weeks when she goes back to work…so it’s a very flexible program. The Sangha Trinidad’s Yoga Teacher Training is $40,000TTD. There are 4 to 10 people and 500hrs….no modules, no airfare if you are local and some of the same North American faculty as in the other trainings abroad. PLUS, you may be invited into an internship in Toronto (if you desire) and/or at The Sangha Trinidad. Now…when you see the numbers can you really say that we are pricey? If I have further convinced you of the value for dollar *smile*, then feel free to contact us at manager@sanghayogatrinidad.com. Every session will begin with a 15 minute meditation and/or pranayama practice led by one of the senior teachers. It is no problem if this is your first time practicing meditation – although the practice will be suitable to more experienced practitioners, no experience is necessary. Incorporating meditation into your day is a great way to cultivate a mindful, productive, stress-free and focused day. We will focus on The Sangha Trinidad’s Yoga Series, which is based on the Principles of Moksha Yoga®. We will explore sequencing in such classes like Flow Classes, More Advanced Classes, Classes with Music, Silent Classes. And touch on Yin Yoga and Strength + Mobility Classes and learning to teach Asana yoga to many levels. Variety in teachers and teaching styles will provide tools for interpretation within the series, and further the process of making your teaching personal and authentic. In this interactive lecture series, each posture in the sequence will be broken down to explore alignment , modifications and variations, “release valves” (including Contraindications), and benefits. We will also discuss the reason for the sequence with regards to Backbends, Forward Bends, Balancing Poses, Twists, Hip Openers, Sun Salutations and Inversions. Each pose will be discussed in deep detail so that the teacher trainers can discover the biomechanics of each posture and hence the safest and most effective way to enter and exit each posture. Teaching Methodology focuses primarily on all the teaching moments that happen before, during and after class. This is a chance to learn how to create comfort and confidence within the art of teaching and defining your teaching practice…being the best instructor that you can be! Communication – helps us how to be be better communicators. We will learn how to make eye contact, the effects of your body language and how to read your students’ body language, verbal cues. PLUS we will learn…“It’s not about you” and what that means. Your teaching tone and the importance of variety, including voice projection, utilizing key ‘trigger’ words, body language and the use of visualization to convey information. How to prepare oneself mentally before teaching a class. Using both verbal and hands-on adjustments. There will also be discussion revolving around the issues of hands-on adjustments, recognizing limitations and how to be most effective in directing students to self-adjust. Learn how to build a sustainable teaching career. Hireability and Saleability. Building your yoga brand and using Social Media. We will explore in detail the nuts and bolts of setting yourself up as an effective yoga professional and introduce practical techniques for managing your time, your finances (NIS, Taxes, etc. ), building your class and workshop numbers, creating a strong and consistent following and ultimately flourishing as a teacher mindfully and with a true yogic mind. Through various sessions will be introduced to the Chakras, the Nadis and the concept of energy. Considering that the Buddha himself was an enlightened yogi, we are introduced to the Buddha’s teachings within the concept of the Yoga Tradition. These lectures illustrates that the common aspiration of all spiritual practitioners is to overcome suffering and imbalance and awaken to our inherent wholeness and union with all things. You will also be introduced to the main yogic texts and their central themes in a way that brings them to life and makes their wisdom relevant for modern yogis. The study of yoga philosophy will plug you into a rich tradition and add depth to your teaching. We are taught how to REACH IN to yourself, awaken your power and realize your full potential. REACH OUT with this power and potential to help positively transform the world through innovative yogic service. We will watch and review movies that are thought provoking and maybe life-changing and see what arises. The diversity of the group should make this truly exciting! This is a chance to document the physical, spiritual and emotional journey that students experience throughout the training. Journaling is an opportunity to slow the mind and work through the challenges and excitement that arise in such an intensive training. Each teacher trainer will be required to give a presentation. Presentation topics will be provided and is a great opportunity to put public speaking skills into practice in a setting that is more comfortable and varied than a standard yoga class. Books will be suggested , but again, all thought provoking, meaningful, with the intention of helping you be the best yoga instructor that you can be! Emphasis will be placed on preparing the teacher trainer for the actual practice of teaching. Each student will have the opportunity to lead small groups of their fellow trainees through several consecutive postures and learn thematic approaches to teaching. The teaching will be followed by feedback sessions. Emphasis will be placed on the teacher trainers watching and observing other teachers. This helps with learning the “tricks of the trade”. During the course of the year of training, teacher trainers will teach publicly (friends or community classes) and receive feedback from them. Emphasis will be placed on touch…the importance of understanding how the touch of an instructor can have a huge impact on your student. Mindfulness, care, healing and love are the focus here. We are taught a short routine that will allow you to incorporate into your classes and to use when you recognize students in extra need. We are introduced to Reiki and its power of healing. Again, helping the teacher trainers understand its affects and all with the intention of making you be the best instructor you can be! After this session, you will be Reiki certified. In this 4-Part lecture series, we will explore how and why yoga is a important to healthy mind and body framed by advances in Cognitive Science, Neurobiology, Philosophy, History & Hands-on Techniques to balance the Nervous System. Following the initial 6-week intensive is a 10-month distance learning program which requires the submission of projects associated with practice teaching and growth. Completion of the entire year long, 500+ hour teacher training is necessary in order to receive your certificate beyond one year of training start date.